The exhibition Robert Rauschenberg at Tate Modern in London is the first posthumous retrospective and the most comprehensive survey of the American artist's work for 20 years. The exhibition covers all chapters of the career of Robert Rauschenberg (1925-2008), from his early experiments at Black Mountain College to his late works. Among the works on display are his iconic Combines (hybrids between painting and sculpture), his transfer drawings and silkscreens, and the Cardboard and Glut works. Some of the highlights are Rauschenberg's Oracle (1962-65), a multi-part sculpture made from scrap-metal parts that he created in collaboration with the engineer Billy Klüver; and the piece Mud Muse (1968-71), an installation that consists of a large metal tank that contains bentonite clay mixed with water, which bubbles and spurts as air is released in response to the sound levels created by the mud bubbling. 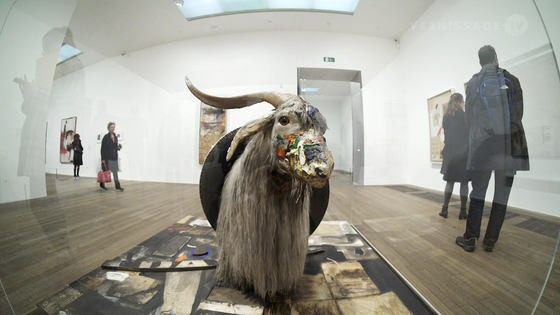 Robert Rauschenberg is organized by Tate Modern and The Museum of Modern Art, New York. The exhibition will travel to The Museum of Modern Art in New York and the San Francisco Museum of Modern Art in 2017. The show at Tate Modern in London runs until April 2017.